The life and work of the great soul whose birthday we joyously celebrate on this auspicious seventh day of the month of Sravan, are themselves rich legacies left by the saint-poet to us of the present-day. In this connection we have to take careful note of one special point regarding the origin of his greatest work Tulasi-Ramayana, popularly known as Ramacharita-Manas. This much-venerated scripture was started by Tulasidas upon one Sri Rama Navami Day, and it is said that on that particular Sri Rama Navami Day the heavenly bodies presented the exact identical conjunctions and astronomical juxtapositions as were present upon the actual day of Bhagavan Sri Rama’s Avatar upon earth, many thousands of years ago. Thus it may be said that in the birth of this inspiring and life-transforming poetical work of the great Tulasi Das, we have a reincarnation of that very divinity (this time in a different form) as appeared in the person of Lord Rama previously. The sacred Ramacharita Manas is, therefore, Bhagavan Sri Rama Himself manifesting and expressing through the written word. No evil realise the sanctity and the glory of the Ramacharita-Manas. Saint Tulasi Das himself was fully aware of this fact, for he states in unmistakable terms: "That man who recites or listens to or sings the lifestory of the ornament of Raghu’s Race (Rama) gets cleansed of all impurities of this iron age and without difficulty attains straight-away to the divine abode of Lord Rama." Study of this rare treasure is, therefore, like unto a dip in the transcendental ocean of Satchidananda itself. It is a nectarine lake bathing in which you attain freedom from all afflictions and casting aside the shackles of birth and death, you rise up into the realm of eternal bliss and immortality. 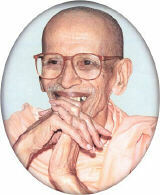 Hail, all Hail, to the divine Ramacharita-Manas. All glory be unto its saintly author. The life of this great saint is filled with a number of inspiring incidents which come as a flood of light revealing to us certain lofty truths of spiritual life. Upon one occasion the jealous enemies of the saintly Tulasi Das wished to destroy the precious manuscripts then being written day-by-day, by the saint. They hired two murderous ruffians for this purpose, who were to break into the house of Tulasi Das at dead of night and bring away the manuscripts. When these fierce felons had gained entrance into his abode on a dark night and were stealthily moving towards the altar wherein the manuscripts reposed, lo, two shining youths with blazing eyes and angered looks confronted them with drawn bows wherein glittered sharp and deadly arrows ready poised to spring forth upon the midnight marauders and make quick end of them, then and there. The ruffians were struck down with fear. They cry out in terror, run up to the sleeping saint and fall at his feet entreating him to protect their lives. They cry: "Oh, sire, save us, oh, save us from these wrathful, young warriors with terrific looks." Thus, it was that in the life of this great saint a tangible presence and the ever-protecting hand of the Lord was a living fact. Similarly did the divine presence come visibly to his aid, when the then emperor tried to persecute the saint. The Lord Hanuman assumed innumerable forms so devastated the capital that the emperor had to come to his knees and ask pardon of saint Tulasi Das. The declaration of the Lord in the Gita that he ever abides by those, who constantly think of Him is practically demonstrated in the experience of Tulasi Das. In his inspiring life, again, we have the evidence of the power of the divine name. Being the ardent votary of Ram-Nam Tulasi Das performed the unbelievable miracle of bringing back to life a dead man through the power of Nama-Kirtan. Man can do almost anything, but to give life to the dead is the prerogative of Lord alone. But the Lord showed through his devotee that He and His Divine Name are one and the same. Through the power of the Name the Lord enabled Tulasi Das to do what He alone could do. By this he had proved for us that the practice of the divine name alone is sufficient to make a man divine as the Nam is the Yuga-Dharma of this age. Before concluding, one more valuable lesson may be gained from the life, namely, the untold benefits of developing our Viveka-Buddhi. As a youth, Saint Tulasi Das was mentally attached to his beautiful young wife. His entire heart’s love and his entire poetical talents were directed and offered at the feet of his beloved. But one day a small incident opened his eye to the folly of such physical attachment and, lo and behold! there was a transformation wrought overnight in this loveful youth. No more the passionate swain, but was left now the young Sadhu with his determination and dispassion fully awakened and thirsting for the realisation of his true Beloved, the Lord Himself. This was possible, because within him Tulasi Das had already the faculty of Viveka in all its fullness though dormant and inactive due to ignorance. It was like dry gun powder all ready to be fired. The one incident acted as a spark to awaken the blaze. But the ordinary man, who has neglected to develop this precious faculty of Viveka and Vichara gets any number of awakening knocks, warnings and frequent reminders from nature, but yet he continues to be the same man. Despite mother Prakriti’s severest blows he fails to learn a lesson and will neither awaken nor be transformed. Not so with true seekers, spiritual aspirants and Sadhakas. For these are men of the stuff, like that out of which saint Tulasi Das was made. Full well do they cultivate the treasure of Viveka, Vairagya, Vichara and the like in their inner beings that even a slight rousing impulse from any experience of life at once springs them into wakefulness and they turn from the lure of the senses towards the call of the immortal. Thus do they walk in the exemplary footsteps of Saint Tulasi Das to whose memory we offer our countless adorations upon this auspicious day.